Music and birdsong have been entwined in mythology and artistic practice through the ages. It would be easy to dismiss the relationship as mere romanticism, yet there remain clear comparisons between birdsong and the way humans express themselves in music. 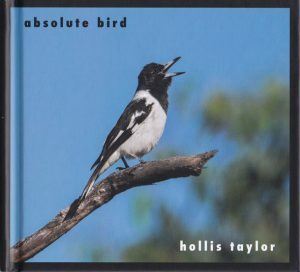 Hollis Taylor’s ‘Absolute Bird’ is a lavishly produced, double CD set and extensive booklet. It is part musical document, part memoir of her travels, and part musing on a bird’s capacity for aesthetic sound making. But above all it is a celebration of a remarkable single species of songbird; the Australian Pied Butcherbird. Their tonally rich songs are often considered among the most musical in the birdworld – not simply by being melodic and pleasing on the ear, but by the bird’s creative exploration of repertoire. As a musician and composer, Hollis became intrigued as much by the butcherbird’s process of singing as their sound, and has traveled widely over many years to document pied butcherbird songs across Australia. From this field work and recording, she has brought her compositional imagination to interpret these butcherbird songs into musical pieces. Many are for solo instruments such as recorders, bassoon, bass or for small vocal ensemble, and all performed by leading players, including Hollis herself on violin. The final blending of field recordings with music offers varying contexts: the human performance accompanied by butcherbird song, by natural or human sounds evoking of a butcherbird’s sonic environment, or simply presented solo. Many of Hollis’s compositions incorporate sounds echoing the butcherbird’s vocal tonality and mannerisms, and the performers exhibit considerable empathy and skill in bringing these to life on conventional instruments. The phrasing structure of butcherbird song forms the basis for a measured delivery, with pauses offering a breathing space in which to listen deeper. Throughout, I feel a sense of delight and whimsy in Hollis’s compositions, and deep respect for the bird musicians themselves. There is currently considerable research being done on the relationship of music to animal vocalisations. As a nature recordist with a fascination for this topic, I find Hollis’s conjectures intriguing, provocative and insightful. As Hollis points out, vocal learning is one capacity humans have that primates don’t. Another is our capacity for rhythm; the synchronising of sound-making among a group of animals to a steady pulse. It’s an ability that I’m not aware of any other animal displaying. Rhythm may thus be a key to understanding the origins of human music, as it is foundational to ancient, indigenous and traditional musics around the world. During the last hundred years or so in western cultures, music has expanded into a looser sense of rhythm, as explored in free jazz, contemporary classical composition and ‘ambient’ musics. The revered French composer Olivier Messiaen specifically explored timing through massive orchestral pieces such as Turangulîla, the chamber work Quartet for the End of Time, and his pioneering transcriptions of birdsong into music. Meanwhile theorist and composer John Cage was promoting engaged listening as a musical act. These developments mark a transition from rhythm bonding performers and audience, into something more personal and reflective, of music being defined by an aesthetic of sound and expression. It is in this more intimate dialogue with the world, that I hear Hollis basing her creativity and enquiry into the nature of birdsong and music. Pied butcherbirds, in their seemingly aesthetic vocalising, may well conform to contemporary values around musical performance. If so, they are one of many songbirds who may also qualify; malabar whistling thrushes, lyrebirds, piping crows and nightingales come to mind. But whether we conclude that birds really are musicians, seems to me less important than that we find a deeper connection and appreciation in listening to them. 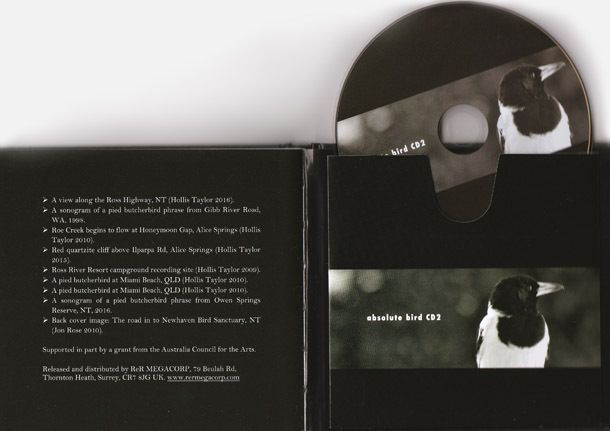 Hollis has spent the last decade and a half creatively exploring her fascination with pied butcherbirds, and the resulting CD set represents a considerable body of work. ‘Absolute Bird’ is Hollis’s thoughtful homage to this intelligent and sublime songbird, and displays her personal response to the sound making of another species.